Hi everyone. 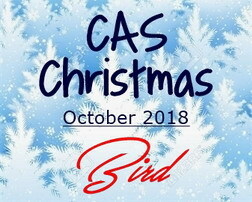 It's the start of the October CAS Christmas Challenge. This month's challenge is being hosted by Susan. When I saw this sweet image from Stampendous, I just had to buy it. :) The image was stamped in black and then heat embossed in clear. The bird, branch and berries are watercoloured with zigs and a water brush. I then added a light wash of blue for the background. Sparkly clear glitter glue was used to highlight the snow on the branches and berries. It sparkles in real life, just doesn't show in the photo. I added heat embossed shabby white Frantage for falling snow and stamped my sentiment. I hope you'll come check out the challenge blog to see the beautiful cards from our wonderful Designers and Guest Designer Sue (Sue's Card Craft). I know you'll be inspired to play along. Time is passing quickly and soon the Christmas cards will need to be in the mail. Come play along with us to help build your stash! How I love these bird stamps for Christmas. This little guy looks so fuzzy I want reach out and touch him. Once again your coloring is impeccable. The soft wash is perfectly done in your background too. Did you get my card yet? I know the post to Canada is painfully slow. That bird is just darling, Loll. I can see why you immediately bought this adorable stamp...that bird is the cutest ever! Love your coloring of the whole scene too! This is one of my favorite bird stamps and I love how you've colored him up with the snow falling around him! I can see some of that frosty sparkle on the snowy branch! Simply beautiful and sweet Christmas bird design, Loll. I love your Zigs watercoloring and added frantage. Your sentiment word has such beautiful font too. TFS my friend. Hugs.. Such a beautiful card, Loll. The bird is lovely and the whole effect is so serene. Well done! The sweetest card and the bird image is adorable. Love the addition of the snow and the frantage, which makes a huge difference...love it x. What a sweet bird Christmas card, Loll! Your Zig watercoloring is so good that I feel like reaching out my hand and touching the soft and fluffy feathers! The glue glitter and shabby white Frantage snow is the perfect finishing detail. I can see the pretty sparkle on the branch in the close-up, but it must look much more beautiful IRL. Wow--this is gorgeous, Loll! I'd frame this! 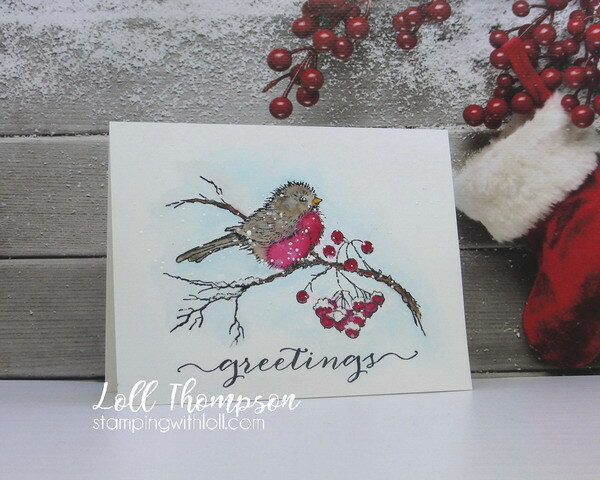 such a precious image and you have used it so well with the faint sponging on the bkg and the way you added the snow details and coloured the bird. Lovely card mf. Such a sweet image and beautifully coloured, Loll. Perfect for the challenge. Loll, what a sweet little bird water colored with your Ziggs. Such a lovely wintery scene. Have a great weekend. What a beautiful image Loll and coloured so realistically. Just gorgeous! This bird is so cute. I perfectly understand that you had to have this stamp. I love all the red beads of berries that you marked around the bird. 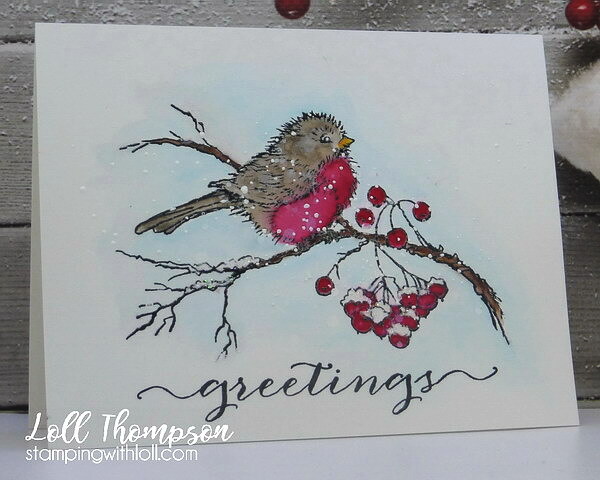 And falling snow ... it creates a great mood on the card. This card is so perfect for sending winter greetings. I adore her. A very late comment from me - I'm just catching up with commenting on all the CAS DT cards I missed while on vacation! I love that bird stamp (you've reminded me to get it out!!). Wonderful watercolouring with your Zigs and great sparkle! Perfect addition of some Frantage snow too!